‘Aquilae Duo’ Lisa Nelsen and Eleanor Turner have worked closely together since 2008 and bring further decades of ensemble playing experience to this immersive flute and harp course. Eleanor’s own flute and harp duo ‘journey’ started at the age of 18 with attending an inspirational flute and harp course with Anna Noakes and Gillian Tingay. It is with huge excitement that their vision of running a course together has come to fruition and whether this would be your first foray into flute and harp, or if you already have a duo, Aquilae would love to share their experience with you and encourage you with your next steps in chamber music studies and performance. Whether you are a professional, a conservatoire student, a postgraduate, a passionate amateur, a teacher or maybe an advanced sixth form student, this course is for you and will stimulate your rehearsal sessions, fuel your hunger for both new music and core repertoire and promote your engagement with living composers and progressive music. 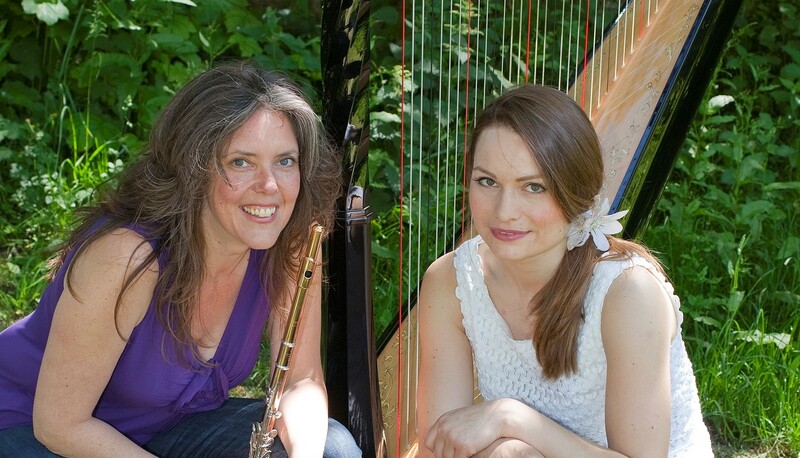 Lisa and Eleanor will perform Debussy’s Trio Sonata and Arlene Sierra’s new trio for flute, viola and harp in a lunchtime concert at MusicFest, together with viola player Cath Leech, which will be followed by a participatory trio workshop. Also on the course, an afternoon will be devoted to the exquisite and seminal masterpiece by Ravel, his Introduction and Allegro for Harp, String Quartet, Clarinet and Flute, with the Solem Quartet and David Campbell joining us for this unique experience. Duet repertoire wise, we are spoilt for choice as flute and harp duos! Lisa and Eleanor have selected a few absolute gems that will act as a solid foundation, bringing satisfaction to your musical partnership as well as being colourful, communicative pieces for audiences to engage with. ‘In Ireland’ by Hamilton Harty will be performed in its concerto version by Lisa and Eleanor at the festival, so that is one of the recommended pieces. The Trio Sonata by Debussy is a joy to discover and play, so opportunities for working with the viola students can be arranged for those who wish to study this piece. William Alwyn’s ‘Naiades’ is a flute and harp extravaganza to learn and treasure forever, so this is another recommended work and beyond that, you could choose a CPE Bach or JS Bach Sonata, shorter pieces such as Fantasia on Greensleeves by Vaughan Williams, miniatures by Ibert or Fauré and contemporary works by Stephen Dodgson, Lowell Liebermann and Ravi Shankar just to name a few. The course involves total immersion in playing in an open, friendly atmosphere and even if those pieces are beyond your current level, don’t be put off: This course is about providing a creative outlet in communicating and performing so all who have a passion for the flute and harp are welcome. The course will start with warm up sessions each day to include improvisation, how to practise, comprehensive work on technique, posture, tone production, breathing, and articulation. Yes, for the harpists too! The course will also explore practical performance to help improve general communication and tackle fears and stage command. When time allows, orchestral and flute ensemble repertoire will be included. There will be a student concert on the final day of the course at 6.15pm in the foyer of the Aberystwyth Arts Centre before the concert that evening. Described by The Times – London as “…a flautist and a half…”, Lisa Nelsen is internationally recognised for her versatility as a flute soloist, chamber and orchestral musician, educator and mentor in performance practices. She grew up on a pig farm in Western Canada, and fed on all kinds of music, from opera to rock to jazz. Her flute and harp duo with Eleanor Turner, Aquilae, has performed to packed audiences across the UK. She is a member of Continuum Ensemble in London, The Harborough Collective, a chamber ensemble led by internationally acclaimed violinist David Le Page, and most recently joined forces with cellist Julian Metzger and pianist Paul Turner in Enigma14. Lisa has given concerts and masterclasses in venues across the UK, Sweden, Austria, The Netherlands, Ireland, Canada, the United States, and Hong Kong. She is a Professor at the Junior Department of the Guildhall School of Music in London and has been teaching as the Specialist Flute Tutor at Wells Cathedral School for more than 15 years. Lisa is an artist for Yamaha Classical Division for the UK and Canada playing a 14k 900series flute. Eleanor Turner is a harpist and composer whose passionate performances have brought herworldwide acclaim. Eleanor creates unique shows for herself and her ensembles, performing at venues such as Amsterdam’s Muziekgebouw aan’t IJ, Berlin’s Kammermusiksaal at the Philharmonie and Shanghai’s Conservatory of Music. She is a member of contemporary folk band Ranagri and is Head of Harp at the Royal Birmingham Conservatoire. Eleanor’s “endless energy, mesmerising talent and unswerving commitment” (Julian Bigg, conductor) have ensured a diverse career with travels, fun and friendships made along the way. Eleanor’s musical career began at the age of fifteen, when she performed a concerto with the Academy of St. Martin in the Fields, conducted by Daniel Harding at London’s Queen Elizabeth Hall. Eleanor studied with Daphne Boden at the Royal College of Music Junior Department, then later with Alison Nicholls. She went on to win First Prize at the 2007 European Harp Competition and many other international awards. Eleanor has been hugely inspired by the American superstar jazz harpist, composer and conductor Deborah Henson-Conant, with whom she has performed in New Orleans, Sydney and Hong Kong. She enjoyscollaborating with performance artists and composes for concert, radio and dance.